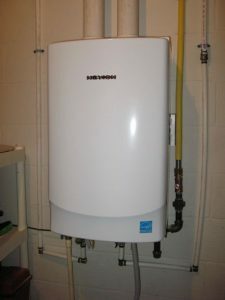 Two questions we hear often about tankless water heaters are: Is a tankless water heating system right for my home? and Will it really save me money? Two great questions we will address later, but first, let’s talk about how a tankless water heater works. Cold water runs through a pipe to the water heating unit. Either a gas or an electric element heats the water. No waiting for a storage tank to fill with enough hot water to deliver it to your location…which means less water wasted at the tap! What are the benefits of a tankless water heater? Are there any downsides? Many tankless water heaters also have a life expectancy of 20+ years, and easy-to-replace parts can extend their lifespan. That’s where your trusted HVAC contractor comes in handy. Select someone who will take the time to talk to you about your needs, and assess the type of unit that will meet your immediate and long-term applications. 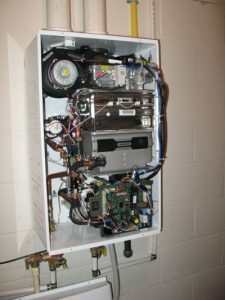 Can you install a tankless water heater yourself, without the help of a contractor? In some cases, yes. But first find out if you need a permit and if there are local water heater installation codes to which you must adhere. If you are running gas lines to the heater, you may want to call in a professional plumber. And don’t forget to check for federal tax programs that you may be able to participate in. Some tankless water heaters may qualify for rebates or credits. Visit www.energysavers.gov for more information. At Cocalico Plumbing & Heating, our team of experienced plumbers can install both traditional and tankless water heaters. We serve homeowners in Lancaster, Lebanon, and Berks counties, and we offer 24 hour emergency plumbing repairs. Call today at 717-738-0760 or use the form on this page to request a free quote for a new water heater.